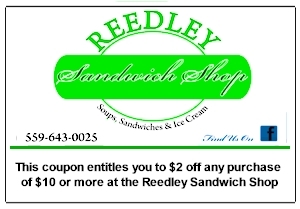 Coupon for Reedley Sandwich Shop at the end of this article. Chinese New Year has a few different names. It is also known as Lunar new year, since many Asian cultures celebrate the new year according to the lunar calendar, and it is also called Spring Festival in China. It is not a single day and evening event like we celebrate according to the Gregorian calendar. Chinese New Year is a national holiday that mandates that Chinese citizens have seven days off. As I discovered while living there, these seven days are filled with people traveling to their hometowns, families sharing delicious foods, festive red and gold decorations everywhere to symbolize prosperity, and the lighting of firecrackers to ward off evil spirits at all hours of the night. Growing up, the tradition I looked forward to the most was paying homage to parents and older relatives and receiving red envelopes filled with money. I was also very fond of the traditional reunion dinner with my immediate family, sometimes with extended family. 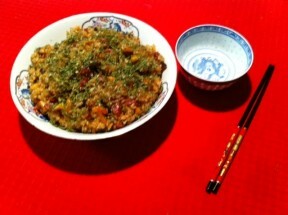 I had grown up eating all the delicious dishes but was ignorant of the meaning of them. The play on words was lost on me because I had failed out of Chinese School and couldn’t read any of the Chinese characters. The meanings of Chinese New Year expressions are all homophones. Words that sound the same but have different meanings. In Chinese, the word for fish and surplus sound the same, so a whole fish is served. The words for chicken and auspiciousness as well as tofu and wealth sound the same. 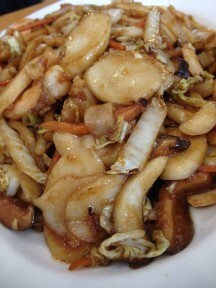 A Chinese rice cake called “nian gao” is a homophone for ongoing prosperity year after year. Dumplings get served because the shape of them represent the shape of ancient Chinese gold nuggets. Mandarin oranges are served and gifted as a symbol of prosperity and good fortune. All of these dishes in one meal make it more elaborate than usual. When I would visit my grandmother, whether it was new year’s or not, she would insist on giving me a send-off that included dumplings to wish me not just prosperity, but that I would not be lacking anything that I needed and that my health would be intact because she wholeheartedly believed that health is wealth. Her conviction was that if you have your health, you can do what you need to do despite any of your circumstances. She was a wise woman. Since I am unable to be with my family for Chinese New Year, I am bringing my own twist to the holiday. I will be celebrating with friends of all ethnicities at a Chinese restaurant in Manhattan’s Chinatown. 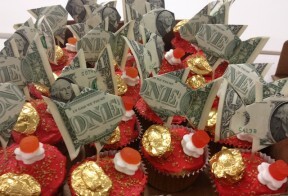 I also packed Chinese New Year into a single cupcake for my coworkers, red and gold with a real dollar bill representing the red envelope. A holiday tradition is only as good as the people you have in your life to celebrate with. As Chinese food and culture begins to go more mainstream and become less stereotyped, many non-Asians are getting in on the Chinese New Year action. School kids are learning the joy of receiving red envelopes with money inside them and their parents are taking them to Chinese New Year parades. The Lunar New Year parades have gained a great deal of popularity over the years. This year Manhattan’s Lunar New Year Parade is on February 17 and Fresno’s parade is on March 2. While I have not taken the time to make my own dumplings from scratch in the recent years, there is nothing more delicious than Three Flavored Dumplings. 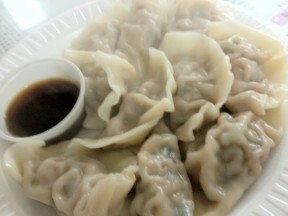 For a quicker homemade dumpling recipe, I am including a recipe that uses pre-made Gyoza wrappers. My aunt’s sticky rice recipe is always a hit and my mother’s steamed fish is my favorite dish to hit the table at New Year’s. 1. Place flour in a large mixing bowl. Slowly drizzle in the cold water as you stir the flour with your fingers Knead the mixture into a dough. 2. Cover the dough with a damp cloth and let rest 20 minutes. 3. Combine the shrimp, chives, pork, sherry, salt, pepper, green onion, and ginger. Mix well. 4. Roll the dough into 3 inch rounds, with the middle about 1/16th of an inch and the edges thinner. 5. Place a heaping tablespoon of the filling onto each wrapper. Place on one hand palm up, pinching the middle closed first, then starting from each corner pinch towards the middle to finish sealing each dumpling. 6. Bring a large pot of water to a boil and boil dumplings (stir gently, occasionally) until cooked through, 7-9 minutes after the water is brought back to a boil. 7. Remove from water and serve immediately. 8. Serve with soy sauce and vinegar on the side. Hot sauce optional. 1. Combine all the ingredients in a large bowl and mix well. 2. Fill each wrapper with a heaping tablespoon of filling. Seal the edges of the dumpling by pinching the edge closed with your fingers, pinching once in the middle, then from each end towards the middle. 3. Cover the bottom of a skillet with the oil. Gently place dumplings while the pan heats on high. Once the pan is hot, add enough water to cover the dumplings halfway and bring water to a boil. Cover, turn the heat to medium and let the dumplings steam. When the water has evaporated, uncover the skillet and let the dumplings brown. Remove from heat immediately and serve with the crisp side of the dumpling facing up. 4. Serve with soy sauce and vinegar on the side. Hot sauce optional. 1. Soak the rice in water for 20 minutes. Rinse 2-3 times. 2. Heat oil in a wok (or pan) on high. Add the sausage, black mushrooms, fried shallots, rice, and soy sauce. Stir fry until rice is evenly coated with oil. 3. Transfer rice to a rice cooker to steam or to a pot with a tight fitting lid. Add 3 cups of water. If using a pot, bring the water to a boil, then turn heat to low and place a tight fitting lid on until the rice cooks through and appears translucent, about 15 minutes. 4. Let rest for 10 minutes before serving. 5. Garnish with chopped parsley. 1. Marinade the fish, inside and out with the ginger, green onion, sherry, and salt. Let sit for 20 minutes. 2. Place fish in a steamer and steam for 15-18 minutes, until the fish becomes flaky. Do not overcook. Remove from heat. 3. Prepare a pan with oil on medium high heat. Stir fry the ham, adding the soy sauce and drippings from the fish. Pour over the sauce over the fish and serve immediately. What a great assortment of information and recipes!!! 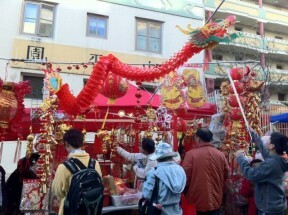 I just got back from China Town in NYC and saw the dragons blessing the merchants!!! What a great and festive time!!! Now I can follow your directions and have a Lunar New Year dinner any time I want!! !